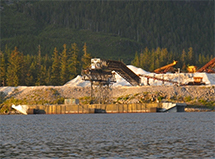 Woodland, WA Manufacturing Plant: Columbia River Carbonate’s manufacturing and warehouse facility is located in Woodland, Washington. At this facility we manufacture high quality calcium carbonate products. There are wet and dry milled calcium carbonate products that are specifically formulated for many uses in agriculture. Pasco, WA: CRC utilizes warehousing in Pasco, WA as a strategic distribution location for bulk prilled lime and gypsum into the Northwest. The Wauconda, Washington, Quarry is located about halfway between the towns of Tonasket and Republic in Northeastern Washington. The area is known as the Okanogan Highlands and is prized for its excellent fishing and hunting. Northeast Washington also has a rich history of mining, logging, and ranching. 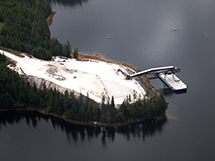 In an effort to expand our resources and better serve our customers, CRC purchased the Calder Marble Mine in December of 2010. 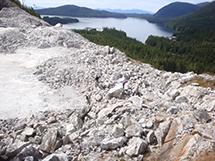 Located on the Prince of Wales Island, 88 air miles west of Ketchikan, AK, Calder has a long history as a world class marble deposit.